Lionsgate is pleased to announce the action-fuelled espionage thriller Criminal, available now on Digital Download and on Blu-ray, DVD and Ultra HD Blu-ray from 15th August 2016. To celebrate its release, we have an action packed Blu-ray movie bundle to give away, featuring Criminal, Survivor, Sicario, Wild Card and London Has Fallen. 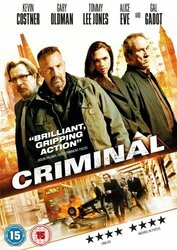 Set in London and from the director of The Iceman – Ariel Vroman – Criminal is a must-own action film this summer! With an incredible cast including upcoming Wonder Woman Gal Gadot (Fast and Furious 6), BAFTA-winner Gary Oldman (Child 44, Dawn of the Planet of the Apes), Oscar® winner Tommy Lee Jones (The Fugitive, Lincoln) and Alice Eve (Star Trek Into Darkness), Criminal encompasses twists and turns that will leave you on the edge-of-your-seat. Criminal follows an unpredictable and dangerous death-row inmate, Jericho (OSCAR® winner Kevin Costner; 3 Days to Kill), who has the skills and memories of a CIA operative (Ryan Reynolds; Deadpool) implanted into his mind, in a last-ditch effort to stop an international terrorist plot. For your chance to win one this Blu-ray bundle, all you need to do is answer the following question below. The competition closes at 23.59 (GMT) on Sunday 28th August 2016. Criminal is available on Blu-ray, Ultra HD Blu-ray and DVD from 15th August 2016 and Digital Download now.